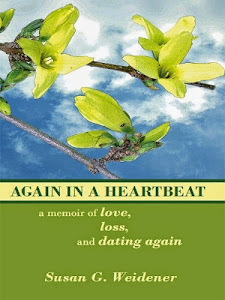 As many of you may know, I have spent the last two years writing the sequel to my memoir, Again in a Heartbeat. As of this writing, I am happy to announce that the new book, Morning at Wellington Square, is finished. Now I move into the next phase, which is marketing. But before I do that, I need to take a moment and reflect. 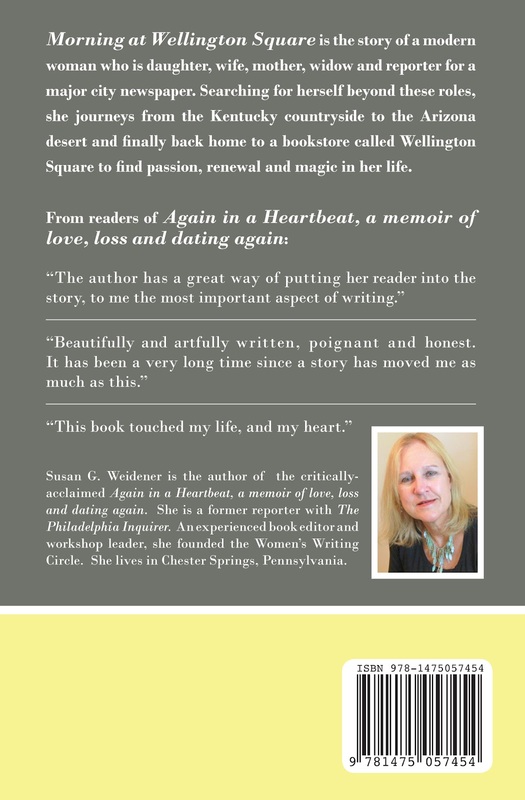 As any memoirist knows, writing one's life story is a healing journey. We need to make sense of our lives, to heal our wounds before we can try to move on. As we begin to focus on the memories and the people that have made the biggest impression on us, our journey leads to the compelling narrative. What is my story? What is the message? Once we understand that, things crystallize, come into focus. We breathe deeply and feel the joy of finding our way out of the darkness, into the light. 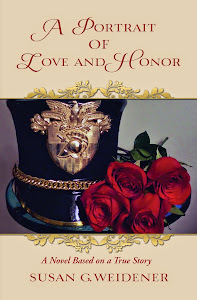 While many new characters are introduced in this book, one of my central characters remains John, my husband. That said, this story is more about me, more a self-reflective journey than the previous memoir. This is a woman searching for herself outside traditional roles of daughter, wife, mother, widow,and career woman. As a middle-aged woman who has watched many of her friends grapple with unemployment, as well as her own, she asks the question: How do we remake ourselves and tap into our passions? Can we? I felt this theme was central to Morning at Wellington Square. My story is about mourning not just a lost career, but the loss of being wife, daughter, sister. It picks up where Again in a Heartbeat left off as the narrator struggles with being single, an empty nester, and her feelings of emotional fatigue. How can she greet a new morning with optimism and hope? This is a woman's journey as she searches for those answers - a modern woman, an everyday woman. 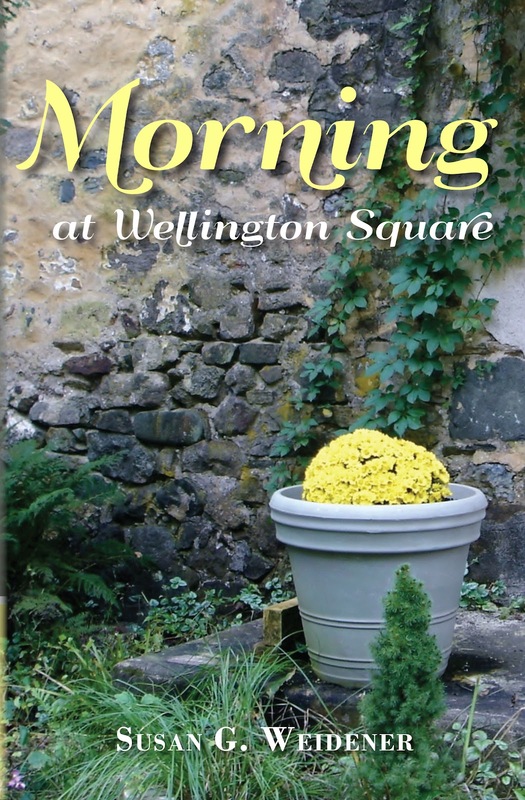 As much as I love the Internet as a way to sell books, I am excited about my first signing at Wellington Square Bookshop from 11 a.m. to 1 p.m. on Saturday, September 22. Details to follow. For now, if in some way my story resonates, helps others going through similar experiences, or is simply an enjoyable "read," I have done my job as a writer. Mostly, I am grateful for the opportunity writing memoir has given me to find the "truth" of my story. A beautiful cover, Susan. Yellow - the color of joy and intellect - against the gray stonework. A lovely image. Good luck! Thank you, dear friend, and for all your help in making this book come to pass. 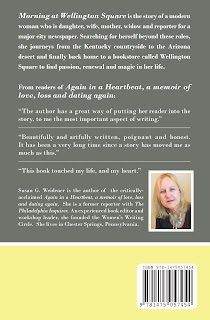 Susan, best of luck with your book signing and of course, beyond. The book cover is very inspiring - great color! Looking forward to hearing more. . . Thank you,Sharla. 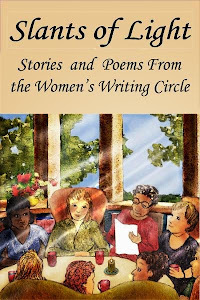 The flowers/the container on the cover - the Writing Circle,of course. As soon as the book goes "live," I will let everyone know. I've just started reading Morning at Wellington Square and if I had to use one word to describe my feelings, it would be comforted. The familiar ache of change is successfully conveyed in the first 34 pages. Recently going through a divorce, my heart has been shattered and is trying desperately to heal. Susan's words are helping. Susan, thank you for your courage. Now please excuse me, I have a wonderful book to read. Thank you so much for sharing. I wish you happiness and healing.